How can you go wrong when you include beer, bacon, and frying in a recipe. This one's for all you bacon lovers. 1. Slice the bacon in half and set aside. 2. Mix the dry ingredients, then whisk in enough beer to make a fairly thin batter. I think you can figure out to do with any beer that might be left over. Nothing, ever goes to waste. 3. Place about 1/2" oil in a black frying pan, and heat to 350 degrees. 4. When the oil is 325, dip the bacon into the batter, hold it up by the end to let any excess batter drip off, then gently lay the bacon in the hot oil. The temperature of the oil should come down to about 300 degrees which is where you want it. If the oil is too hot, the bacon won't cook through. 5. Cook about 4 minutes per side, or, until the bacon is crispy, and the batter is well browned. 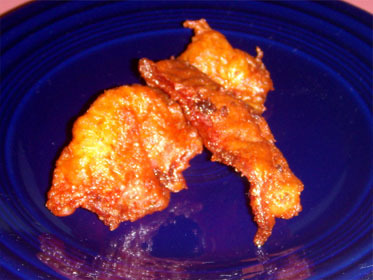 If you find that the batter is falling off the bacon while frying, the oil might not be hot enough. Or, there was too much oil on the bacon when you dipped it into the batter. If this is happening to you, dip the bacon in seasoned flour (Flour, Balcken, and Coarse Kosher Salt) before dipping it into the batter. The flour will absorb any moisture or oil on the bacon, and give the batter a better chance to stick.